Credit: NASA Earth Observatory. Download this image (JPG, 608 KB). [22-Jun-16] Observations of chlorophyll during the Korea - United States Ocean Color (KORUS-OC) field campaign. KORUS-OC is an oceanographic field study being conducted in conjunction with the air quality campaign, KORUS-AQ. 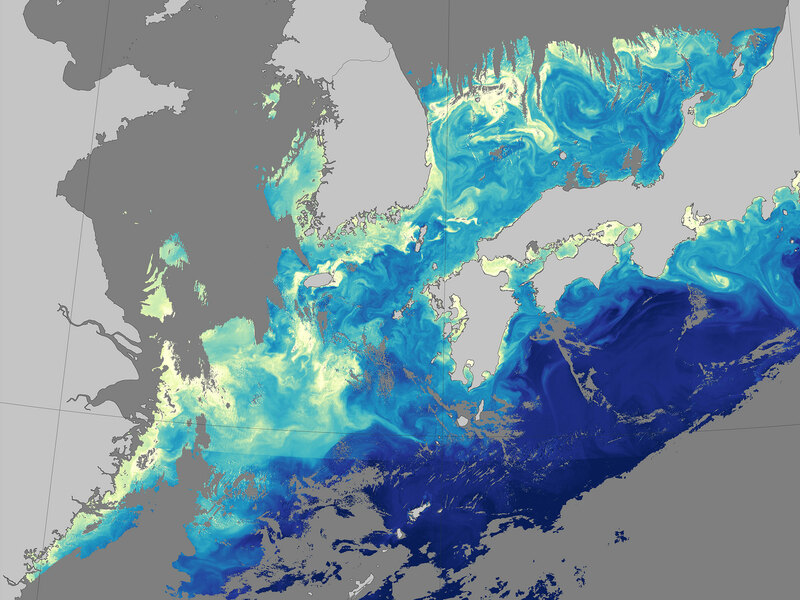 Led by NASA and the Korean Institute of Ocean Science and Technology (KIOST), KORUS-OC focuses on the links between satellite- and ship-based measurements of ocean color, biology and biogeochemistry, as well as atmospheric composition in coastal waters adjacent to the Republic of Korea. This image shows chlorophyll concentrations in the waters off of South Korea and Japan on May 12, 2016. These data were collected by the Geostationary Ocean Color Imager (GOCI), an instrument on South Korea's Communication, Ocean and Meteorological Satellite (COMS).